Hey guys I have a really quick question while I wait for my computer to restart. It seems at its worse during the installation. Computer freezes 3-10 seconds, Crashes games like supreme commander. Mostly when I'm installing something too. I have my CPU at 10% load the entire time and it still stutters. It doesn't do it when I play MOST games. I've replaced the Motherboard, Hard Drive x 2, CPU, tested the RAM, re-seated almost everything several times. And no matter what boot device I use I always have issues with my computer hitting crazy stuttering. I've checked event viewer, it's showing nothing. I've re-installed windows several times. I'm doing a memtest86 right now AGAIN. I just did that prime95 test, my entire computer crashes because of heat, but when its not running this it's hitting those freezing points. (replacing CPU paste because I think that's the heating issue.) I've made the page file from 16gb to 256mb to see if it was that no luck. I've disabled indexing. I've turned of system restoring. What I want to do which is why im posting here, (because you guys opinions/advice matters to me <3) Im just about to give up I've been working on this issue for months. I want to disable Speed Stepping, I was told that it will run my system at 100% speed all the time. I'm hoping this will fix this. I was also told to disable C1E and EIST or something like that, but I want your guises opinions. If you're overheating due to load then your CPU will throttle down (slow down) to compensate which will make things crash or go real slow. Get the heat under control. AMD doesn't have speed step, it has cool and quiet. Turn that off and the CPU speed won't dip down. Turn off power states too. If you don't get heat under control it won't stop the crashing or slow problem though. Yes, you need to have more TIM. 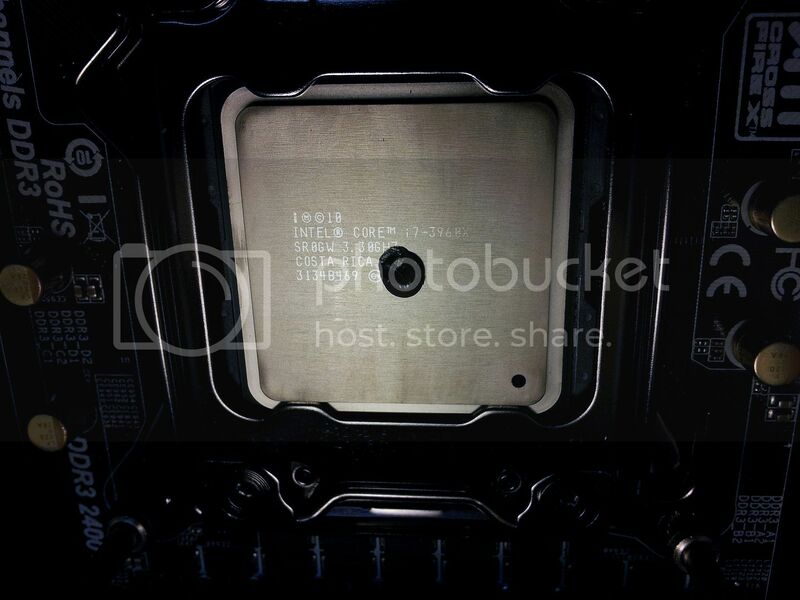 Without it, the CPU IHS doesn't have proper contact with the cold plate. When you get a new tube, make sure to put a grain of rice sized dot in the center without spreading it. Then put the cold plate on without moving and tighten it down. Like this. Take note, yours will be slightly smaller, as socket 2011 CPUs are physically bigger in size and require a tad more for coverage. So I'm using Prime95, and it keeps shutting off on the small FFT and the large FFT what do I do? Take two RAM sticks out and double check to make sure all RAM settings are set properly. Also, how are temps with new paste during testing? Still in the 70s? I put the new paste on it. It seems to be hitting a cooler min on my heat, but I just hit 72 doing both a large and smaller FFT. There are only 2 sticks in and it still heated up during the large. Should I try the other two?